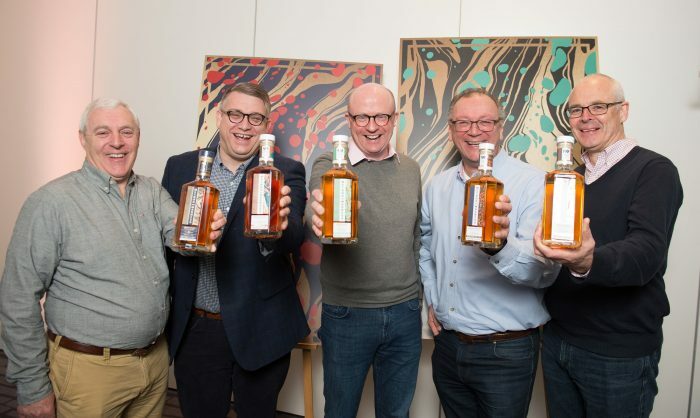 The young and the old made the trip up from Midleton Distillery to launch four new whiskies in Dublin last week, all under the banner of Method & Madness. The old guard was made up of Ger Buckley (Master Cooper), Brian Nation (Master Distiller), Kevin O’Gorman (Master of Maturation) , Billy Leighton (Master Blender), David Quinn (Master of Whiskey Science). Lots of Masters. The new team included David McCabe (Apprentice blender), Karen Cotter (Apprentice Distiller), and Katherine Condon (Apprentice distiller). 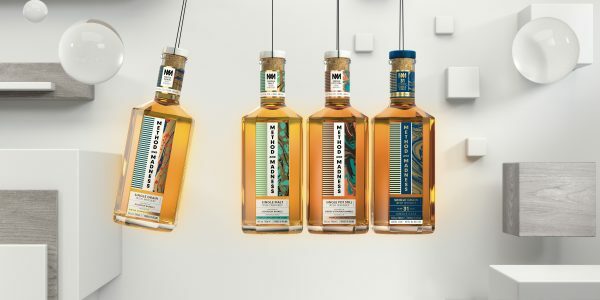 Irish Distillers cannot be accused of resting on their laurels, having launched several new or revamped ranges of whiskey over the last few years. The Method & Madness series allows the team to experiment with limited releases of more exciting styles of whiskey. As they have just taken delivery of a new micro-distillery, currently being installed in Midleton, we can expect more in the future. 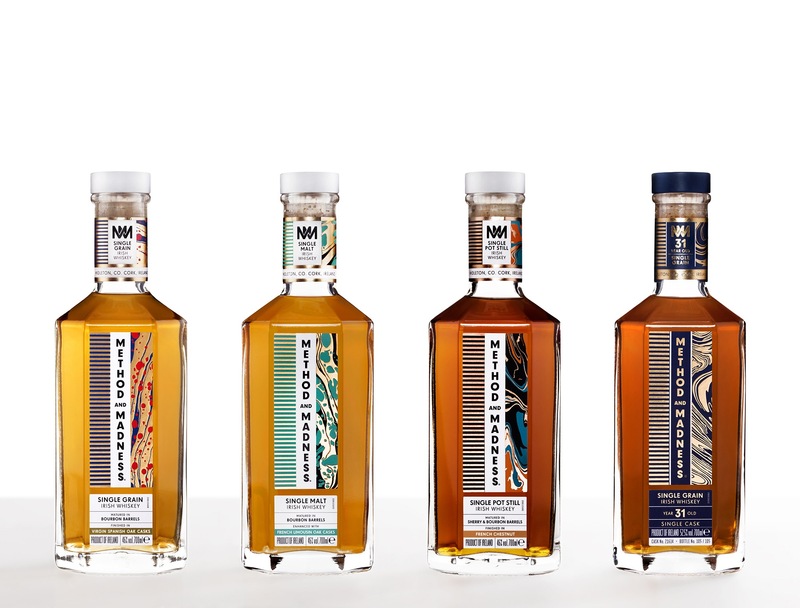 This is a genuinely fascinating range of whiskeys. Single Grain Irish Whiskey Finished in Virgin Spanish oak casks. 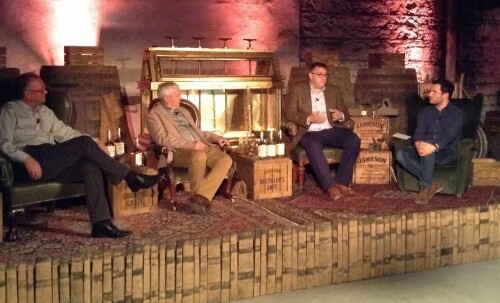 ‘The Irish Whiskey Act allows us to push the boat out’, says Billy Leighton, as it doesn’t limit ageing to oak casks. They used sweet chestnut or Spanish chestnut, unrelated to Horse Chestnut, for this whiskey, and the result is spectacular. Ger is delighted with how it turned out. This is an amazing whiskey with a warm spicy rounded nose, a big powerful palate, with plenty of wood character, sweet spices, honey and golden syrup. 46% €69. Just three casks of this were made, and all bottled separately. It was distilled in 1985. We tasted cask 21614 which yielded 105 bottles. A wonderful delicate nose, sweetish but more precise, elegant and incredibly long, with honeyed fruits and spice on the finish. 52.5% €1,500 a bottle! On a wonderful, crisp, clear, sunny morning last December, I headed up to the beautiful Ballydowling Wood in Glenealy, Co Wicklow. There, I watched a 150-year-old native Irish oak tree being felled. The tree was destined to become an oak barrel, (in fact three to four barrels) used to mature and season the latest edition of Midleton Dair Ghaelach, the unique single-pot-still whiskey that is aged in virgin Irish oak. Gabriel Fernández Rodríguez of the Madebar sawmill in Galicia was on hand to approve the quality of the wood, and to work out how many barrels he could garner from this tree, as was master cooper Ger Buckley, along with Irish Distillers head blender Billy Leighton and head of maturation Kevin O’Gorman. All three have been involved in this fascinating exercise for the last seven years. 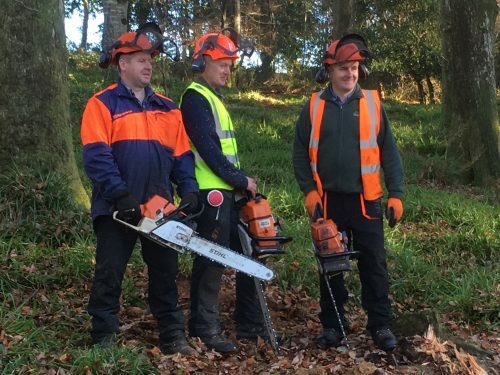 The forest, sustainably farmed by Coillte, was one of the first to be managed under the Native Woodland Scheme, and part of the Programme for the Endorsement of Forest Certification. Along with 11 others, the felled tree would go on a trip to Galicia, where Gabriel and his father would saw them into staves. Then the staves would be transported to Jerez in the south of Spain, to be seasoned for 15 months and fashioned into 250-litre casks, before being returned to Ireland some two years later. Back home, they will be filled with some of the finest old single-pot-still whiskey. All being well, this will become the third release of Dair Ghaelach. Each bottle will be traceable back to a specific barrel and the individual tree. A few specialist off-licences still have stocks of the first release of Dair Ghaelach, yours for about €260. The next release is planned for later this year. Further whiskey news: Irish Whiskey Magazine, run by a group of very knowledgeable enthusiasts, is, I think, our first specialist publication about Irish whiskey. 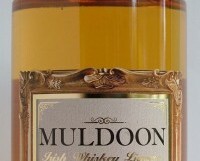 See irishwhiskeymagazine.com for subscription details. Whiskey aficionados will soon be flocking to city-centre Dublin. We already have the Irish Whiskey Museum on Grafton Street and the Teeling distillery in the Liberties. They will soon be joined, in March, by the refurbished Jameson visitor centre in the Smithfield area of Dublin 7, followed by the Pearse Lyons Distillery in the renovated deconsecrated St James’s Church in Dublin 8. In the meantime, I would be tempted to take the train to Killarney and the Irish Whiskey Experience to enjoy one of their 50-minute courses covering various aspects of Irish whiskey and how to enjoy it (see irishwhiskeyexperience.net for details). While in Kerry, a visit to Dingle Distillery would certainly be on the cards too. Alternatively, the Kilkenny Whiskey Guild is a group of 10 establishments in the city, all of whom offer at least 60 whiskies, served by a trained bartender. One of my favourite whiskeys, and very well priced; dried fruits, raisins, toasted hazelnuts and coffee in a delicious warming spirit. Deliciously richly fruity with raisins, toasted almonds and caramel. A limited edition made exclusively for O’Briens, using Amarone casks from Musella, one of their suppliers. It works really well. Chocolate, vanilla and butterscotch with a touch of honey. Stockists: Celtic Whiskey and other independent off-licences. Irish craft brewers are fond of ageing their beers, usually stout, in casks previously used to age whiskey. The resulting beers can be very good, sometimes gaining a percent or two in alcohol, as well as flavour, from the wood. But what happens if the barrel is returned to the distiller and used to further age whiskey? First out of the blocks on this were Jameson and Cork craft brewer Franciscan Well. ‘It all started in 2013 it started when Shane Long of Franciscan Brewery asked us for a dozen used whiskey barrels to make a special Christmas brew’, says David Quinn, head of Whiskey Science at Jameson . ‘We tasted the results and thought it was fantastic. He did a second batch in 2014, and we got a call asking us to take the barrels back, as he didn’t have the space to keep them. More on a whim, we decided to refill them with mature Jameson and left them for 4-5 months. We had a taste and were blown away. It came across as discernably Jameson, spicy, fragrant and fruity, but with other characters through the interaction with stout – coffee, cocoa and chocolate and hints of hop. They were all there at a level of intensity that complemented instead of dominating. The taste had a different complexion; a texture, a creamy mouthfeel a coating sensation we found fascinating’. Jameson ran a pilot scheme in Dublin and Cork, and as with the stout, the shelves were cleared in a couple of weeks. In 2015, they started to lay down enough barrels to launch Caskmates abroad. Apparently it has gone down very well in the U.S. So much so that Jameson linked up with craft brewers in London and Brooklyn, supplying them with whiskey barrels to create their own limited edition beer, and then releasing a local unique Caskmates. Jameson are no longer alone; back in March, Galway Bay Brewery launched 200 Fathoms, an Imperial stout aged in whiskey casks borrowed from Dublin’s Teeling Whiskey. Now the favour has been returned with a single cask release from Teelings of 200 Fathoms whiskey, aged in the stout casks. Another distiller has plans in the pipeline. Glendalough Whiskey gave a couple of barrels to Five Lamps brewery for their barrel-aged porter. The barrels were returned and filled with 10 year-old single malt. 400 bottles will be produced, available later this year in Dublin Travel Retail. I tasted it on a visit to the distillery; it was rich and full of chocolate. Lastly O’Haras have been working with Tullamore Dew for their (delicious) Leann Folláin stout, aged in whiskey casks. It seems only a matter of time before the favour is returned. For the moment, Tullamore DEW offer a whiskey aged in cider casks. Whiskey infused with hazelnuts and toffee. Delicious sweet caramel and toasted nuts. Stockists Celtic Whiskey; World Wide Wines and other specialist off-licences. Scented fruity and mildly spicy; long and sweet with coffee, chocolate and subtle hops. Superb whiskey. Stockists: Exclusively from Teelings Distillery, Dublin 8. 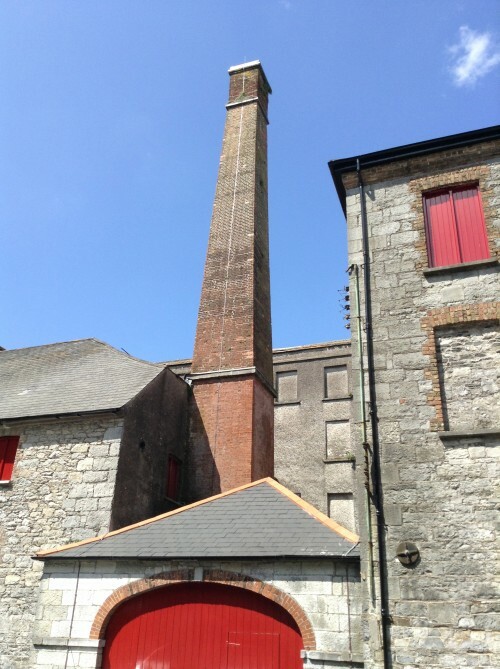 Teelings – A quick tour of Dublin’s Newest Whiskey Distillery. The Liberties, close to the very heart of Dublin, was once known as a centre for distilling. The tradition died out over the last two centuries, but recently construction began on no less than four new distilleries within a four kilometre radius. I visited Teelings this morning. Two very dynamic brothers, sons of a very dynamic father, these guys are making some very good innovative whiskey. Some pics to get started with tasting notes on their produce to follow. The Rivals – just around the corner. Thank you Alex Chasko for the tour.